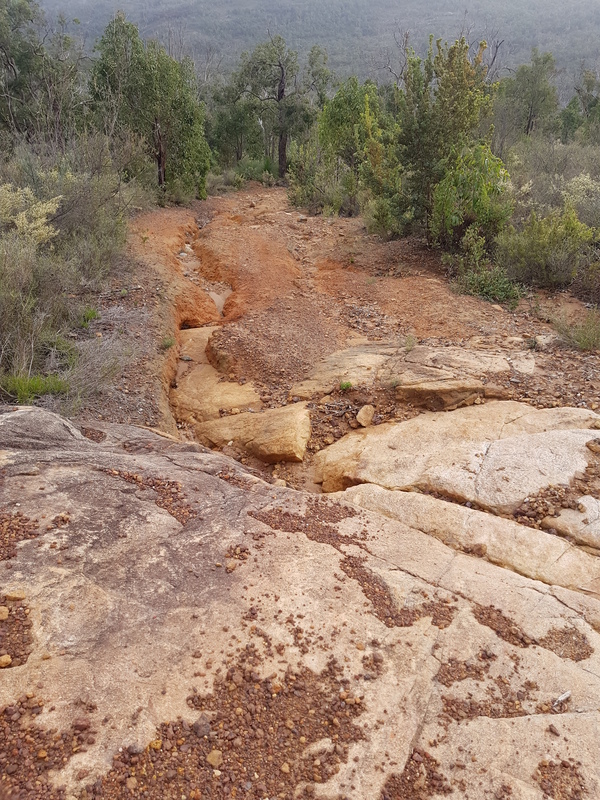 I took the chance this weekend to scope out some possible off-road riding trails near the southern Perth suburbs. The inspiration was one of my athletes, who is training for a 1000km mountain bike adventure. 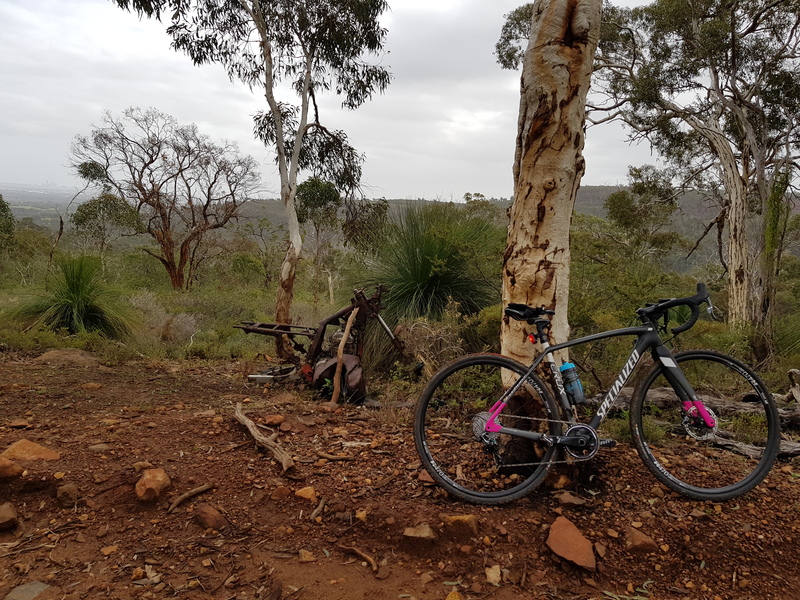 We have been looking for some hilly training rides that she can do before work to maximise elevation gain and minimise encounters with peak hour traffic. The potential trails I’d found by online mapping included a few walk tracks and some gradients well above 20%. I had hopes that this might not be the case and the walk trails might be rideable … but I’m getting ahead of myself. 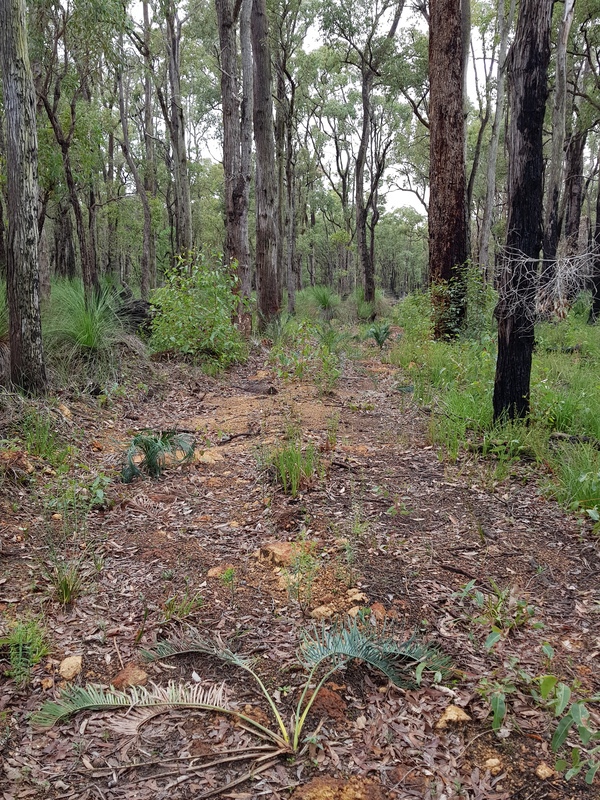 I set off from Pickering Brook and headed off-road on a trail that ran parallel to Canning Rd, heading east. So far so good. 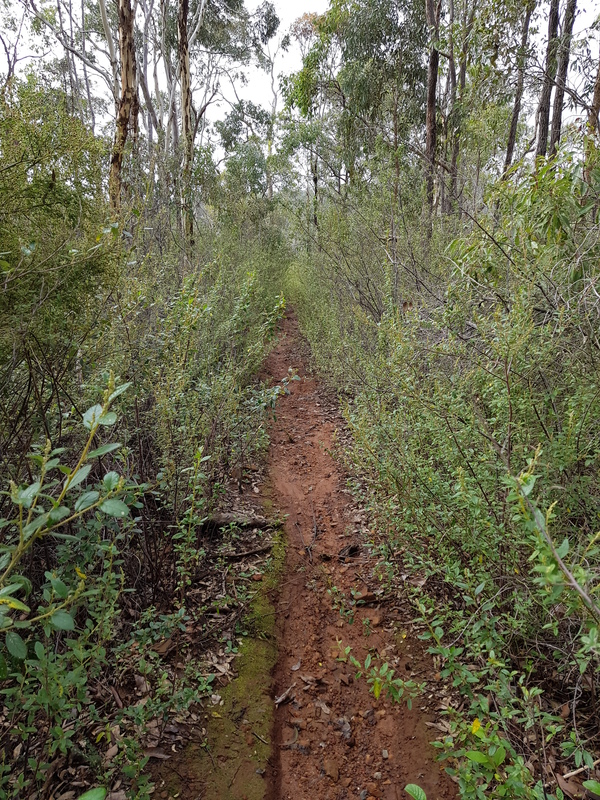 Although parts of the trail were a bit overgrown, it was rideable. I then reached the Mason and Bird Heritage Trail. This was a great trail, car width, well formed, and with the sound of a river trickling along the trail. However, there were a few rocky bits that were a bit too loose to tackle on the cyclocross bike, so I got a bit of practice in bike hiking. It would be fantastic by mountain bike though! I reached Bickley outdoor recreation camp, which is where my ride route headed onto the walk tracks with steep gradients. I took one look at the trail heading up the mountain and quickly decided that it wasn’t rideable. So, change of plans – skip that section of the ride. I headed south, towards Victoria Dam. This was an excellent trail as well. Except that it went perpendicular to the contours on the map – i.e. straight uphill. And even this would’ve been ok except that I have only a 42 tooth chain ring on my cx bike and I just didn’t have enough gears. I can’t wait till my oval 36 tooth chain ring arrives! So, more practice carrying my bike. Near the top I found views of the city and a rusty old motorbike! Finally the road plateaued and I reached the turnoff for the next section of trail – which turned out to be a nice piece of singletrack! Well, it started as a nice piece of singletrack. Then it became a technical narrow downhill piece of singletrack that would’ve been tricky on my mountain bike. I took a different road at the top of the hill, along a trail that would connect back into the Mason and Bird Trail. It looked promising, car width and rideable. But yet again it became very rocky and steep. And rutted and rocky. I was getting very experienced at carrying my bike today! I do think this section would be mostly rideable by mountain bike – but tough! Finally I got to the Mason and Bird Trail. I realised that I’d walked quite a few rocky sections coming down this road. 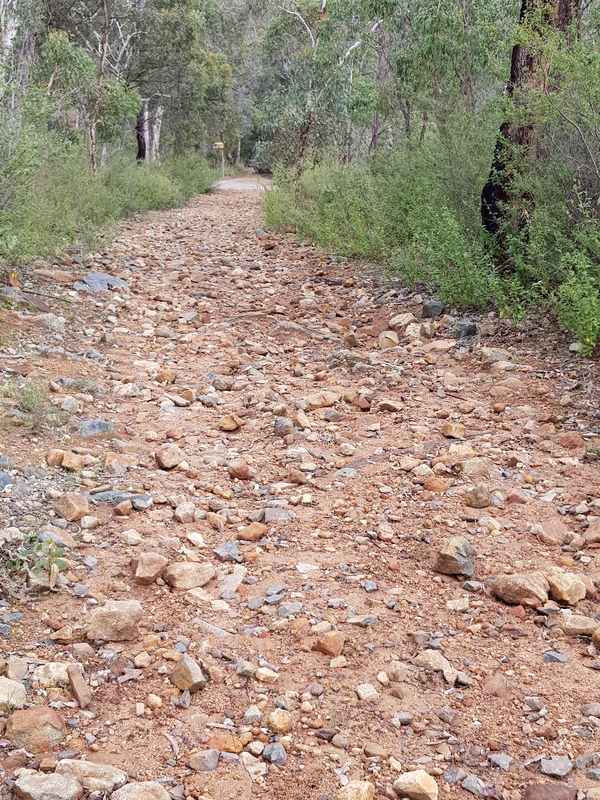 While I could have taken it back the way I came, I was running behind schedule to get back to see the finish of the Kalamunda 50 and I thought all the rocky sections would slow me down. 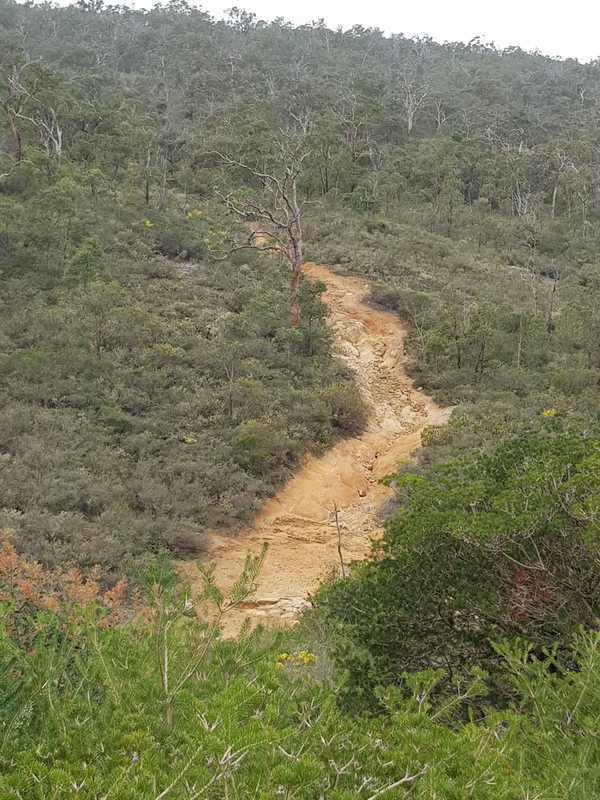 I found a road on the map that would take me to Victoria Dam, then a road from the dam that would take me back to Canning Rd. Quick along the road to the dam. At the dam, all I could find was walk trails! What to do? Walk trails might mean not rideable. But back tracking would mean losing heaps more time. I took a gamble on the walk trails. Carry my bike through the entrance gates. 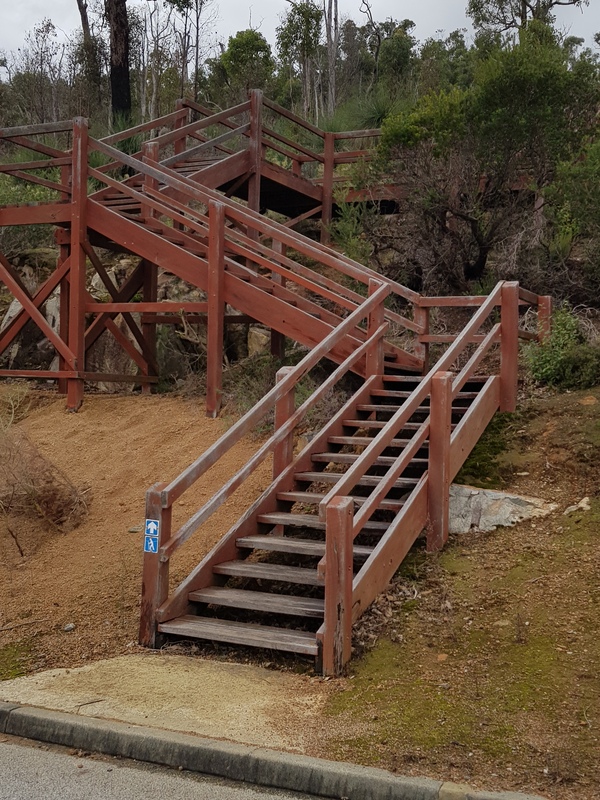 Ride along the trail – to find some stairs to a lookout. Ok, up the stairs and the walk trail continues along the other side. And finally I find the road – hooray! Along the road, then onto Masonmill Rd, then Canning Rd. I got back to Pickering Brook, quick check that Annie hadn’t already finished, then to the finish line to watch her come in. I had been waiting for about five minutes and just started to settle in for a long wait – then I see a flash of orange and it is Annie! Quick get the camera out and snap a few photos of her finish. 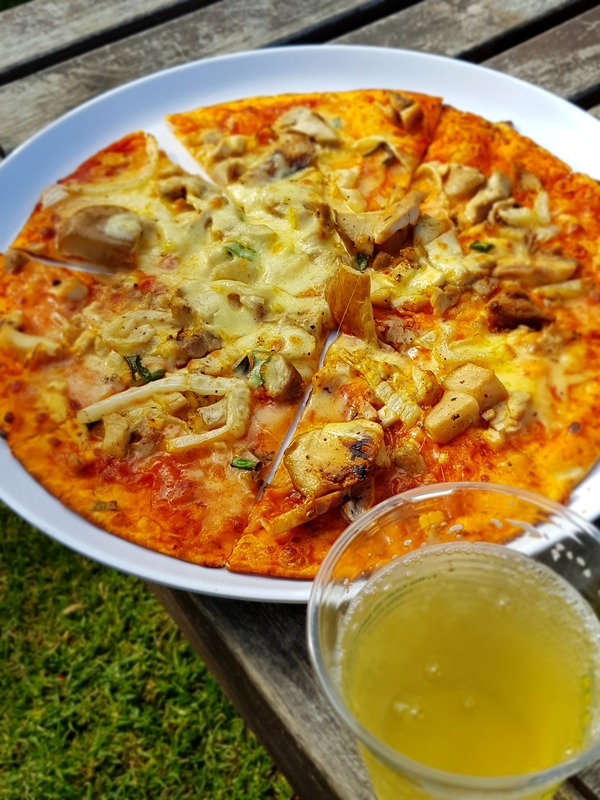 Prefect timing and what a good day, finished off with pizza and cider at Core Cider House. So what are you waiting for? Get out on a bike adventure! There’s some great riding/exploring to be had on the east side of Walyunga National Park, down in the valleys. thanks for the tip! Is that between the river and O’Brien rd? I’ve just had a quick look on Google maps. Pretty much. The whole area from Bells Rapids all the way up to Jumperkine has heaps of tracks along the valley, including down along Wooroloo Brook (nice scenic riding following the south side). Easy tracks plus variable steep tracks up the hills. Variable surfaces, including blue-metal along the Railway Maintenance road. Most other places are your standard-fare hardpacked with loose on top. Good idea to take a small water filter if you have one. You can even carry your bike across the river (when the water levels are low) to the Walyunga Car Park. Awesome views at the tops of the hills from either side of the Avon. Been out that way the last few months on my road bike, using 32mm tyres. Not ideal width; just waiting for my proper gravel bike to turn up, so I can tackle things better. I usually just make a day trip of it; riding out from the city.